The third event in my quick tour of Israel-Palestine peace efforts is a program called Encounter. 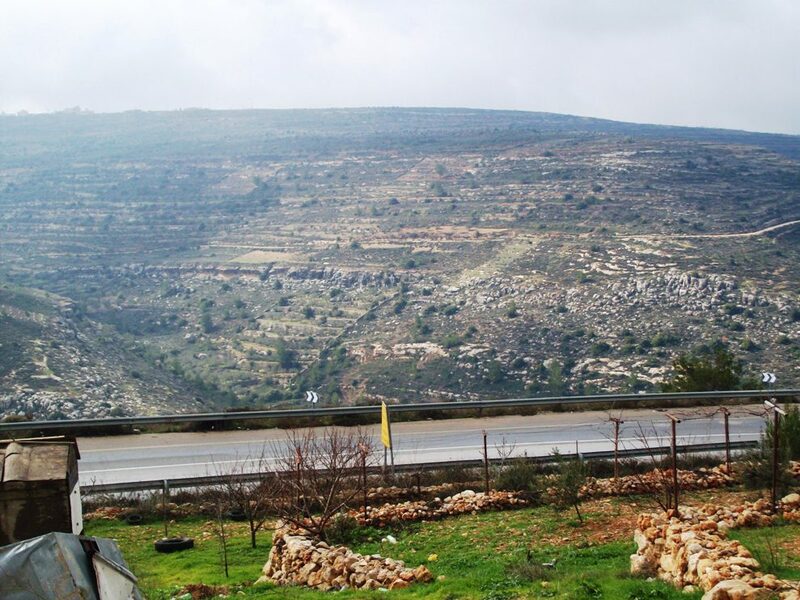 Encounter takes future leaders of American Jewry on tours of Bethlehem and other areas of the West Bank, and introduces them to residents and experts who can convey something of the Palestinian experience. They call it a "listening tour," because the purpose is for us to hear what these people have to say (and see their homes or neighborhoods) and ask questions, but not to respond with our own counter-narratives. Participants go there to take in information and experience and be changed, but not to change the people we meet. After my experience with NVC, I'm really valuing the willingness to listen without speaking. I think that it can be easier to listen openly if you accept from the very beginning that you won't be changing anyone else's mind. This is only half a solution, of course, because the other side has to listen eventually as well, but it's a great half. The leadership of Encounter hides their own political agenda, beyond the basic "Peace is good." It's a choice not to interpret the experience for us, and I think it makes the experience that much more powerful. Instead, they provide future Jewish leadership with a personal experience of Palestine and Palestinians, then let them go out and use that experience however they will. They're trying to promote intra-Jewish conversation about Palestine without determining what that conversation will look like. I appreciated the trust in that. Encounter was a very full, very intense, two-day endeavor, and it would be hopeless to try to capture all of it in blog form. I'm going to try my best, but I'm splitting my report into two pieces to make it possible. In keeping with Encounter's approach, I'm going to try to report what I saw and heard here in the first post, and save most of my editorializing for the second. Even so, this will be a long post, but I urge you to read the whole thing. I'm recounting some Palestinians' own experience of their situation, here, and I'm not trying to filter out their biases or check their facts. I'm trying to hide my own biases, but they'll probably peek through here and there. So I'm sure some people reading this will want to argue about the facts or how they're interpreted, but please understand that this is just what I heard and saw, as clearly as I can recount it. Unfortunately, I can't actually tell you about our first stop. We visited an institution that's very concerned about its internet presence, and they requested, at least for the time being, that we not write about them online. But we learned about a number of kids who have been traumatized by the occupation and efforts to help them live healthy lives. The people who talked to us are doing brave, difficult work in dark circumstances, and I wish I could tell you all about it. Back on the bus, driving through Bethlehem, I was surprised by how much of a city it is. I guess I'd been walking around with unexamined conflicting assumptions about life in the West Bank. On the one hand, I was struck by the poor plumbing at our first stop. On the other, I was also struck by the taxis on the road, pizzerias and shwarma stands. A giant English billboard for Kit-Kat bars. Arabic ads for Lipton tea and Gauloise cigarettes. Signs for "Holy Land Dry Clean" and "Cooperative Society for Pressing Olives." I've driven through towns in America with weaker economies than this one. Bethlehem gets the boost of Christian tourism, but it's still surprising. On some level, I'd thought the whole West Bank might be one big refugee camp. I didn't think they'd be pushing Kit Kat bars. This might not count as reporting without editorial. I'll save the rest of my surprise for the next post. I'm hurt and moved by the hatred shown in some places. I'm touched that hatred is expressed so much less artfully than hope and yearning. We asked our guide why so much of the art was in English and other European languages. He said that a lot of it isn't painted by Palestinians, but by sympathetic visitors. While we walked around, the guide told us about the history of the Wall, and the Palestinian experience of it. He told us about how the Wall doesn't follow the recognized borders, but pushes into the West Bank, officially to protect Israelis and Israeli settlements. He said that the path of the Wall is often adjusted to put water and other resources on the Israeli side, or to include settlements in Israel that were built after the official settlement freeze, sometimes ten miles or more inside the official border. The Wall is said to be a security measure and not a political boundary, but it's harder and harder for Palestinians to claim land and resources on the other side. According to our guide, the Wall is becoming the real border between Israel and Palestine, and it's being unilaterally imposed by Israel. He said at one point, "This is one country. It's very hard to divide it. But if we must, we need to agree on the borders." He said, "This is a whole series of injustices." He said, "I don't feel free. I can't go for a walk without identification." He said "Peace protects people. Walls do not." The Wall can separate people's homes from their own land, or from their villages. We saw one house surrounded by it on three sides. The residents have been told never to open their blinds on the top floor or go out onto their rooftop. When they had to fix some plumbing on the roof, it was a major diplomatic incident. The particular stretch of Wall we saw reaches into the city of Bethlehem to surround the Israeli passageway to a holy site. Our guide told us that no one had ever been harmed while visiting that site before, but Israeli leadership refused to have people pass through Palestinian-controlled territory in order to access it. Back on the bus, our guide took us through a town that doesn't have any sewage systems. It's in Area B, the region designated for Israeli municipal government. The Israelis are ready to hook up sewage lines, but they're going to connect them to the sewage lines for a nearby settlement. For some reason, allowing the Israelis to do this involves the Palestinian government acknowledging the legitimacy of the settlement, which weakens their negotiating position. The settlement has plumbing, so both governments are making these people poop outdoors for the sake of a bargaining chip. He also took us to the edge of a valley, where we could see the Wall on the opposite side. And we could see where the Wall just stops. He pointed out a route to walk straight from where we were into West Jerusalem, with some mud and hills in the way, but no barriers or checkpoints. He said that the Wall makes it hard to get into West Jerusalem legally, but doesn't stop people from doing so illegally. It's often claimed in Israel that the Wall stopped the suicide attacks, but our guide disagreed. He didn't offer an alternative theory. Someone asked him what he would say to Israelis who feel safer with the Wall. He said "Wait and see. This Wall is turning the West Bank into Gaza. If the Gazification of the West Bank continues... More walls, more fences, more checkpoints, more land confiscation, more poverty, nothing to do with their lives... Why will people make peace?" I was pretty overwhelmed at this point. We had lunch at a hotel (some very taste rice pilaf) and then some small-group processing time. I was still overwhelmed afterwards when we heard personal narratives from three Palestinians. I kinda spaced out during their presentation, so I can only say a little bit about what went on there. The first speaker, a woman, talked about her very political mother. She said that her mother, her father, and all of her brothers had been arrested at various times for speaking against the Occupation. She said they had never acted violently, but they'd been called terrorists. Later on one of her brothers, then another, were shot by Israeli soldiers. She said she didn't want to be political herself, but she had formed a group of bereaved people from Israel and Palestine, where they could share their experiences together. Someone asked what she hopes for. "I want my daughter to go to college. I want my kids to see the sea." The second speaker works in Palestinian media, trying to bring attention to non-violent peace work. She said that all of the Palestinian news outlets buy into the conflict in one way or another. There isn't a voice for true, non-violent Palestinian leadership. There isn't any fair representation of Israelis in Palestine either, to tell Palestinians that they have partners and supporters on the other side. When Palestinians do see Israelis demonstrating for peace, it helps them get by. The third speaker has lived in a refugee camp his whole life. He talked about people living in tents and tiny houses. The children of the middle-class who fled their homes in '48. Many of them could leave the refugee camp, but they stay to maintain their claims to land in Israel. He said the clinic in his camp gets 600 visitors a day. They have one doctor and two nurses there. We had some more process time after these presentations. I don't want to talk too much about other participants' reactions to the program, but I was really moved and supported by what they all had to say. Many people pointed out details in the presentations and our surroundings that I'd missed, and the context that each person brought to the experience helped me internalize it a little better, make a little more sense about it all. The Encounter facilitators were really skillful at creating a space for people to share in. Many times over, other participants said how important it was for them to have heard these people's stories. Next up, some Palestinian families came in to play games with us and hang out. Encounter sends people to locals' homes for the night, and these were the host families of some of the participants. We played some silly games, making noises and faces and cheering and running around, getting comfortable together. We played Rock, Paper, Scissors, where once somebody beat you, you had to follow them around and cheer them on while they played against other people. In the end, it came down to a 9-year-old Palestinian girl against a 40-something American rabbi, with dozens of people cheering for each of them. The little girl won, thank goodness. Afterward we played some serious games. Step into the circle if you've ever been to Jordan. Step into the circle if you speak Hebrew. Step into the circle if you know someone who was injured or killed by violence in this conflict. One-state solution. Two-state solution. Step into the circle if you've lost a family member. More of the Jews than I expected knew people who had been injured or killed. More of the Palestinians than I expected had family in Syria, Jordan, and Lebanon. We broke into smaller groups for conversation after the games. We mostly exchanged names and brief biographies. Very little stuck with me of what was said there but this, from an older Palestinian man: "The Wall is not for security. It's a political issue. My name is on a black list. I'm in their computers. So I can never go to Israel. And it's hard for Israelis to come here." (It's a felony for Israeli citizens to enter Palestinian-controlled cities.) "It's the people like you, with American passports, that can go back and forth. Here, we are in prison. Sometimes I look at myself like I'm in a zoo. And here is a donkey and a tiger and a giraffe. People come to visit me, and I'm in a cage." Another man, younger, said, "The Palestinian is a welcoming people. But the Palestinian is a wounded people." He talked about Arab hospitality, and how nice Palestinians are by nature. But they are wounded. His English wasn't very good, but he said, "The Israelis we see are the settlers. The Israelis we see are the ones who have the power. Change only happens when you see the other side. I can forgive, but I will always keep my distance. But for them, too... The way I feel, I'm sure they feel the same way. Not that we attack them, but they're scared. But what we do to them is nothing compared to what they've done to us for 63 years." We went to dinner, all together, at a nice Palestinian restaurant. We walked past beautiful, aromatic, unkosher barbecue to enjoy a nice vegetarian meal inside. And Hey! They've got Arabic Coca-Cola! I got to meet my host for the night, and I spent part of the evening talking with him and a young Palestinian woman. She told us a bit about dating a Jordanian man, and how rarely they get to see each other. She seemed to like it that way. In other towns in Palestine, she said, young people don't date at all. I noticed that both my host and this young woman were very well dressed. I asked where they shopped. She bought most of her clothes in Jordan. He bought his in Tel Aviv, Dubai, and various cities around Europe. There's no good shopping in the West Bank, they said. I asked if most Palestinians travel as much as they do, and they said definitely not. After dinner, many people danced. Some American Pop music, some Palestinian Pop music, and some drumming and singing, all mixed together. I was very full, and I didn't feel like dancing. I chatted with other Americans about familiar subjects, maybe just for the relief. Two other participants were staying at this man's house with me. In his car on the way there, we listened to a very Jazzy Arabic duet of "Perhaps, Perhaps, Perhaps." (This isn't it, but it's close enough for comparison.) I had no idea such a thing existed. I was further stunned when we got to his house and saw his mother watching what, as far as I could tell, was an Arabic equivalent to Law&Order. This whole trip was going on during the height of the Egyptian demonstrations, so our host overruled his mother and changed the channel to Al-Jazeera. We sat and watched for twenty minutes or so, hoping Mubarak would come out and speak, and our host explained a bit about his politics to us. He really admired what was going on in Egypt, he said. Like many of our speakers during the day, he felt like his voice wasn't represented at all in Palestinian politics. "There are only two parties: Fatah is corrupt, and Hamas is too violent. Nobody speaks for the normal Palestinian." The normal Palestinian, he said, wants peace, a single state, and economic prosperity. He and his mother are Christians. We asked if he ever felt hostility from his Muslim neighbors, and he said he didn't. "Arab is Arab," he said. "Palestinian is Palestinian." A lot of Christian Arabs have left Bethelehem since Israel took over, so perhaps not everyone feels that way, but that's what he had to say. We slept in his guest house, a beautiful old building with low ceilings and meter-thick stone walls. Of two beds and a couch, I took the couch and slept remarkably well. In the morning we went back to the hotel, prayed, ate breakfast, and got on with learning about Palestine. Our next presentation was a big-picture overview of the West Bank situation, using a slideshow put together by the UN Office for the Coordination of Humanitarian Affairs, available to anyone here. 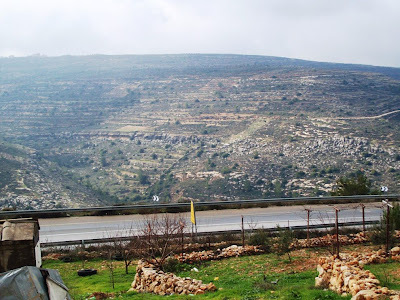 (It's the one called "West Bank and East Jerusalem," although we only saw the West Bank parts.) The presenter was a sweet, soft-spoken guy, extremely knowledgeable about the region, who took us methodically through the constricting space available for Palestinians in the West Bank. I've got a lot of thoughts about this presentation, and questions I wasn't able to ask. (I emailed him a week ago, too, and never heard back.) For the time being, I'm just gonna pass on the information as the guy gave it to us, but this is one area where I'm especially tempted to comment. The West Bank was divided by the 1993 Oslo Accords into three regions. Area A (Major cities, 10% of the West Bank) is protected and administrated by the Palestinian Authority, and Israeli citizens may not enter. Area B (30%) surrounds Area A, with Palestinian municipal government and Israeli security. 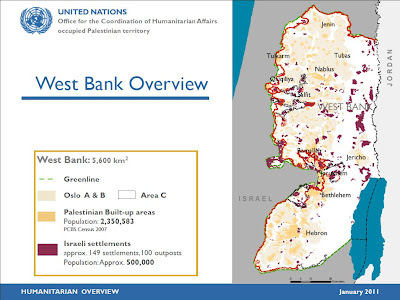 About 3 million Palestinians live in Areas A and B. Area C covers the remaining 60% of the West Bank, with only 150,000 Palestinians living there. In the original agreement, the Palestinian Authority was supposed to take control of the whole region within five years. So life is pretty congested at this point in Areas A and B, but the Israeli government makes it very hard to build in Area C. Construction is prohibited in 70% of Area C, and "restricted" in 29% (We never heard what that means, exactly. It sounds like you could build if you got a permit, but no one ever gets a permit. ), so Palestinians are only limited to living in 41% of Palestine. Buildings built in Area C are demolished or threatened with demolition. Families whose homes are demolished receive about $1500 from the PA and a tent from the Red Cross. There are about 200 demolitions a year displacing 670 or so people, with over 3000 pending demolition orders and roughly 60,000 Palestinians living in un-permitted buildings. At the same time, Israeli settlements in the West Bank are increasing and expanding, and construction continues on the Wall. Both of these factors decrease the amount of land in Area C.
Current and planned Wall construction. The Green Line is the formal name for the pre-1967 border, the officially recognized border between Israel and the West Bank. Aside from diminishing space, freedom of movement is the other major human rights issue in the West Bank. It's in part because of these settlements that Israel maintains roadblocks and checkpoints inside Area C. These have declined significantly since 2008, however, so that it's now fairly easy to travel within the West Bank. Legal ccess to Jordan or Jerusalem remains difficult. Continued construction of settlements and Wall also interferes with progress toward a two-state solution, which is preferred by most foreign powers and officially supported by the Israeli government. He called it the Fragmentation of the West Bank, and it steadily erodes the possibility of a contiguous Palestinian state. Settlers might eventually be relocated back to Israel, but the government is still providing financial incentives for people moving into the West Bank: you can buy a nice house in a settlement for less than $50,000 to be paid over thirty years. Settler-on-Palestinian violence continues as well. When illegal settlements are demolished by the Israeli government, the residents punish the local Palestinian population. They call it the "price tag" strategy, the idea being that Palestinians will pay the price for any harm done to settlements. There were 352 recorded incidents of settler violence in 2009, and 476 in 2010. Less than 10% of the time is anyone arrested. Settlers continue to use religious rhetoric in their claim to the land, but Fatah and Hamas, the Palestinian political parties, have both stopped doing so. The official Palestinian positions are now much more focused on human rights and international law. They've realized, says our presenter, that their strongest negotiating tool is their international legitimacy, which they're now trying to bolster. Like I said, I had a lot of questions about this presentation. So did everyone else in the group. In the end we had to wrap it up with a great many of them still unasked, and move on to our last speaker. She was such a character, I can't bear not to give her a name. But she's wary of attention on the internet, so I'll call her Vivian and lie about some details. Picture everybody's favorite aunt, lively, loud, passionate, a little bit crazy. Someone who gestures with her whole body. She said the view from her family home is her most prized possession. In theory, the government owes her family a lot of money for the land being confiscated. But the paperwork said "sale" and not "confiscation," so the family refused to sign it and now gets nothing. After this section of Wall is complete, Boston will be totally cut off from the rest of Palestine. People will need to pass through checkpoints to go to work or anywhere else. It's decorated on the Israeli side. The blank grey cement is for Palestinian eyes. When asked why, Israeli soldiers said they were doing Palestinians a favor - giving them an opportunity to paint and be creative. The Wall should have been built a few hundred meters further away from Boston, but - and this was the official position, spoken out loud in the Israeli Supreme Court - it was moved, lest it get too close to a zoo on the Israeli side. Vivian also talked about holes in the Wall, and how easy it is to cross it. She took us to another spot with a clear walk into West Jerusalem. From near Boston, where the Wall hasn't been built yet but will be soon, I could see some of the same landmarks that are visible from my roof. Vivian said a few times that if anyone wanted to attack Jerusalem, they could. The wall only stops the ones trying to get in legally. So she has no reason to believe that the Wall is really being built for security. Whatever the truth may be, to her eyes it's an Israeli land grab, trying to squeeze her and everyone else out of her village so Israelis can settle there, too. We asked Vivian why she thought the attacks on Israel had stopped, if it wasn't because of the Wall. She says that Hamas sent suicide bombers to discredit Fatah and interfere with negotiations with Israel. Once Hamas stopped sending bombers, other groups sent them instead to discredit Hamas. We asked her if attacks would resume once negotiations resumed. She said no, that Hamas is too much part of the system now, and no one else has the will or resources for attacks. She says that Palestinians were just as shocked by the bombings as Israelis were. Vivian also took us to a couple houses on the outskirts of the town, houses that won't be included inside the wall. Instead, electric fences will be built surrounding each house, and the children living there will have to pass through four military gates to get to school. Not the school they currently go to, though, because the monks who run it cut a deal to be on the Israeli side of the Wall. Two Israeli soldiers drove by in a truck while she was talking. Vivian joked after them "You don't have to be so loud. It's okay. We already hate you." Some people asked her about it - she thinks that Israeli soldiers are intentionally provocative. Part of their plan to drive her whole neighborhood out. Eventually, she thinks they'll succeed. Over lunch, we got Vivian talking about her hopes and fears for the future. She's a one-state solution lady. She says the land is too small, with too few resources, for us to get by without working together. "We will not survive without joint leadership," she said. She talked about global warming and deforestation, and said "A two-state solution is no solution." Someone asked her about the Palestinian birthrate. They would very soon become the majority in a single state, and many Jews wouldn't feel safe. She said "The birthrate is more scary without a solution than with one." And later, "You will never be secure if I'm not. I will never be secure if you're not." And again, "We will only survive together." But she also said that the normal people in Palestine, the uneducated people, they don't want a one-state solution. They don't want to be part of anything to do with Israel. They will give up anything to make Israel to leave them alone. She sees a fight for survival among her own people, as well as a struggle with Israel. She said that she can't afford the luxury of giving up hope. She said that Israel has no reason to negotiate, and Palestine has no power to negotiate. She said, "Israel isn't a state that created an army. It's an army that created a state." A lot of people at the table glowered at that one. Like everyone else we spoke to, Vivian was very excited about Egypt. She wanted a similar uprising in Palestine. One way or another, she thinks there will be an uprising soon. "There's no trust in the government." she said, "Within three years, there will be either a peaceful uprising like Egypt or another Intifada. The last one was ugly. I think the coming one will be the ugliest. Nobody can afford that." The checkpoint itself was like an airport, with space for long lines and slow bureaucracy, but with heavily armed soldiers scattered throughout. We showed our passports once to get out of Palestine, and again to get into West Jerusalem. It was almost empty while we passed through, but the facilitators assured us it's packed from wall to wall every morning, starting as early as 4am. I was distracted and overwhelmed, walking through the checkpoint, but I could see its potential as a place of misery and oppression. And that was it. We went to a synagogue in West Jerusalem for a little bit more processing. We shared images that had stuck with us from the trip. What surprised us. What gave us hope. How we might use this experience in our home communities. And we went home. So clearly, this was a big deal for me. I was very affected by the whole thing, surprised and moved and saddened and inspired. I went home and crashed, and cried, and stared at the wall for a while. It took me a few weeks to put my thoughts in order about the trip, and I'm clearly still processing it all. I'd really love to know what you think. Was it Good? Yes Was it Effective? Yes. Half of the participants were rabbis or rabbinical students. Others were studying to be Jewish educators of various stripes. All of them were selected by Encounter as future Jewish leaders. I know that everyone had their own reactions to what we saw and heard there, some more skeptical than others, but they're all going into their future roles with a direct experience that will inform their whole community's relationship with Palestine. However the conflict plays out over the next few decades, a more informed, maybe more sympathetic American Jewish community will be an influence for the good. Personal reactions to a few moments of Encounter. 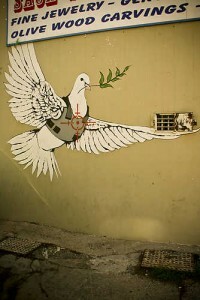 My dream-vision of Lady Palestine, the nature of hope, and the Yotam Plan for Peace. Personally I don't beleive that either of these sides has the answers. I went on Encounter independent of my school, and I would very gladly do a similar experience with anyone else. I really do want to see other sides of the story, and after Encounter, I found myself really curious to hear about Settler perspectives on the same questions. Reading the article you linked to, though, I don't think it disagrees with anything I heard on Encounter. None of the people I met in Bethlehem held up the Palestinian government as virtuous or innocent. None of them trust their government and or feel well-represented by it. It's shocking that the the Palestinian government encourages violence, but I don't know if that means anything at all about the Palestinian popular will. When you read that article and my post next to each other, what do you see as the disagreement? At the risk of trivializing this amazing article, I have to say that the photo of the wall being built reflected in the bus window is jaw-dropping. You could get it posted with a myopically tailored version of this article on any of the dozen greatest design blogs. After reading this, I'm thinking about eminent domain, the forcing of Native Americans onto reservations, crossing into Tijuana from San Diego, as well as sand castles being built over and over and washed away by the high tide... The sand castle analogy seems too fanciful and inevitable to satisfy the gravity of the situation affecting those under constant threat of habitat demolition. The wall that only stops people from crossing over legally is vaguely reminiscent for me of the Defensible Design movement of the 60's and 70's that used symbolic boundaries and barriers to dissuade unwanted elements of society from entering high-density developments. It was lauded in it's time as a solution to the staggering crime rates in the projects, but in fact just deflected the anti-social behavior into other areas. I will try in the future to be less upset when an application for a Variance of a Silicon Valley suburban "planning" code is rejected. Thanks Yotam for posting this.